I am still not too sure about this product. I have run it previously on several sites I maintain but eventually removed it. It was a personal preference, it was irritating to have the previews pop-up everywhere. The often got in the way of under lying links I wanted to reach. These and other usability issues have been discussed and criticized on the Internet. I have recently put Snap Shots back into this website as they have a new option to allow only previews from the icon next to a link. This makes it much more manageable. 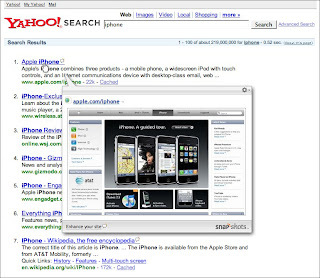 I have installed it as I think that, for example, the Snap Shots of search results will be very useful.